GALER: Plague of heroes NOW AVAILABLE on Steam!! Rumors of a mysterious plague is running rampant through various parts of the world. What starts out as a disease becomes something mush worse, and the citizens start looking to those who claim to have the answer. A select few begin to hear a voice, a voice that tells them that salvation lies in unity. Follow each character as they join together in one of the last standing kingdoms in GALER, and are told the truth behind the end of the world and what they need to do to prevent it. Internal struggles coupled with outside forces wreak havoc on their ability to cope with the situation at hand, but they must accept themselves and each other if they hope to survive in what is soon to be a land of the dead. This game carries with it the look and feel of an old school Final Fantasy, but also involves a zombie survival horror element. I tried to capture both at the same time! "All that we have is each other, and them..."
Nice! We could always use more old school games. Ooh, I like that title screen! IT'S ONLINE ASKING FOR YOUR VOTE!!! I had just submitted my video game for consideration on the Steam GreenLight project! This site is dedicated to helping independant game developers be chosen based on the consensus of the gamers who would like to see your video game being published. A vote for this game honestly does mean the world to me. Help me make my dream become a reality!!! It's possible to put RM2K/3 games on Steam..? Yes, it is!! However, you have to be prepared for all the mudslingers who hate RPGMaker. So, I hope it gets picked, but I won't be holding my breath. Right now a friend of mine has told me there have been roughly 12-14 RPGMaker games to go on Steam Greenlight project. Not sure if any were greenlit though. Currently my game: "GALER: Plague of Heroes" is currently 40% of the way to the TOP 100 games on Steam Greenlight!!! I want to thank all of you who have helped make this possible!!! If you haven't already, please vote if you feel it is worthy!!! Voted for you on greenlight! Good luck!! Just wanted you all to know that my video game "GALER: Plague of heroes", has been GREENLIT on Steam!!! I wanted to give away some free keys to the members of the RPGMaker universe, as you guys rock!!! And clicking on the link below will allow you to send me an email if you would like a free key when my game launches Aug 31st! Thanks so much for all your help and support!!! This is more than just a 'game' for me, it is my story and perhaps others while they are playing my game can relate to it. That is my sole purpose for eventually finishing this game in 2015. Unfortunately, I am having difficulty in implementing some of the new features, and as a result I have pushed back my release date to February 3rd, 2017. Sorry for getting some people's hopes up, but when this launches I really want it to be the best effort of mine possible. Here is my final and therefore official trailer for "GALER: Plague of heroes"
I did up a playthrough/walkthrough of my game to show the mechanics and gaming style. I have decided to launch a free contest, where the winner will get to have their own unique character in my game, "GALER: Plague of heroes!" Having played hundreds of classic JRPGs, I'm always on the lookout for a fresh experience. Zombies are still a rare appearance in classic JRPGs. "Wolfenhain", a free German RPG, implemented them in a Low Fantasy setting last year. "Galer: Plague of Heroes" is this year's High Fantasy JRPG embodiment. If you like Final Fantasy VI (large cast of characters, dawning apocalypse scenario) and zombies, bothered to read my review and don't dislike RPG Maker (2003) games, there's a good chance this game might appeal to you. While the story (see the game description) is executed fairly well (despite/because of a lack of major, but therefore also often unbelievable plot twists), it suffers from typos and a "doughy", seemingly unrelated beginning. If you can make it past that, though, you'll have a hard time finding another JRPG like Galer that forces you this strongly to question your heroes' success. Despair's palpable as you seem to fight a losing battle. This might be the game's greatest merit, as the heroes' victory in other JRPGs is never in any real danger (unless these games deliberately offer "bad ending" or "chaos" routes). Finally, a satisfying ending rounds out the story. The beginning is typical JRPG fare (visit town, clear dungeon, rinse and repeat). Things get more interesting when the player is granted full control over his own home base. Here, he can change party members, forge equipment, create items and much more. A lot of systems and mechanics have been implemented compared to other JRPGs of this kind. While this is commendable, the player can find enough rare equipment in dungeons without ever having to rely on the opportunities the home base has to offer. 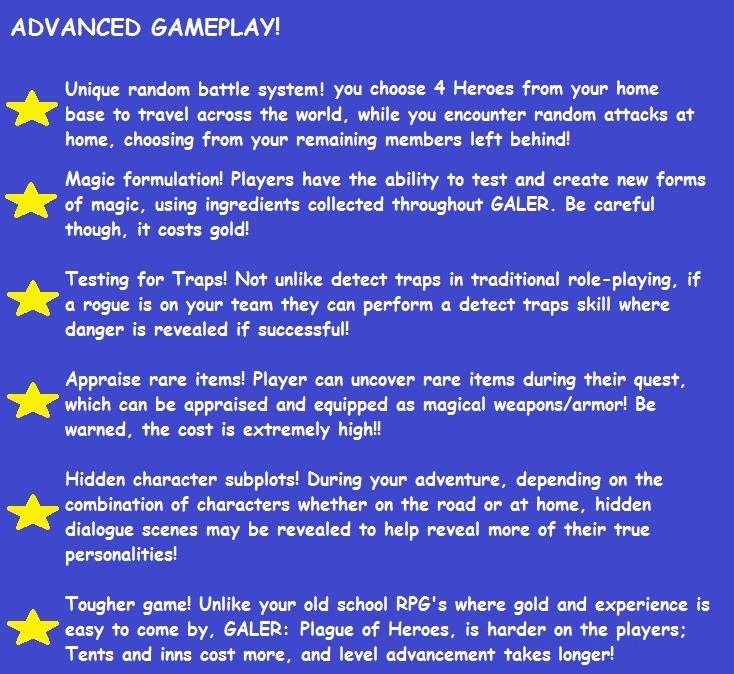 Speaking of implemented mechanics, there's a rather unique one: When traversing the world map, the player doesn't only fight random encounters on the world map, but also random encounters to protect the home base (either-or, so this doesn't mean twice as much random encounters). This feature creates the chance to test all characters in battle and contributes to the story scenario's flair. Furthermore, if the home base party is strong enough to scare monsters away (happens automatically), the player receives a "Wild Card" that awards, when used, a randomly created bonus. The effects range from mere money to (permanent) status-raising items, free level-ups, summons that can be used in battle and even new skills. I deem this mechanic refreshing, but easily abusable once the party members are strong enough. In any case, be prepared for a rather high random encounter rate with no way of mitigating it. Apocalypse isn't known to let the players rest. When the home base becomes available, the player has to choose a difficulty setting. "Normal" leaves everything as it is, but "difficult" forces the player to buy food rations in order to survive overworld trips. Despite underlining the fight for survival, this feature complicates exploring the world map, so I'm glad it's purely optional. It may very well be this feature doesn't pose a problem anymore once the player is able to travel by (air)ship. My biggest gripe with the large cast of characters is that there aren't enough meaningful battles for all of them to participate in. There are some scenarios that force the player to use certain party members, but it just isn't enough (so don't expect a "Suikoden"). Especially the game's final stage, despite being intense as hell, wastes a lot of potential in this regard (compare JRPGs like "Legends of Illarion" that force the player to use all party members by forming different parties for simultaneously - successively - fought battles). It doesn't help that many characters receive hardly any development (if any at all). The antagonists aren't anything special, but they get their jobs done. On the other hand, the main characters and their problems are likable and believable. To name a few: Paladins struggling with the fact that the god they believed in may not exist, regular people having to cope with the loss of their friends, a defector having a hard time to be (and feel) accepted - while the wheel isn't reinvented, any JRPG player will feel right at home. Dependent on which party members the player takes (and sometimes doesn't take!) with him to certain locations, he's awarded with additional story scenes or side quests that become available. The player can discover enough hints to find most of the optional stuff, but he's likely to miss something without developer's knowledge. Most of the side quests unlock scenes from the past of certain characters, which the player can view at the home base. There are also some "one-time only dungeons" and other permanently missable things. Thus, be aware that this game can be frustrating for completionists, particularly as it doesn't offer any replay value. Another typical problem that comes with (too) many party members: The player doesn't know which characters will be useful until the end. Should you level up your characters evenly or concentrate on a few select ones? It's definitely the latter for this game. Since there are enough (voluntary) opportunities to grind and even to buy level-ups for party members (using money earned in-game at the home base, requiring increasing amounts of money at higher levels), any player will be able to circumnavigate potential "roadblocks". The game features some unwinnable boss battles, though, a device I truly despise. This is even more aggravating considering this game could really use more boss battles in general. Fortunately, at least the ones available can be exciting and force the player to make full use of all his battle options. Battles feature the standard RPG Maker 2003 system, which means ATB ("active time battles") like in earlier Final Fantasy games. Bars fill up for your party members, and if a bar is completely full, you can input an action. Dependent on the setting, this system either resembles real-time combat (“active”) or turn-based combat (“wait”). The wait function is fully automatic, so battles halt completely when it's the player’s turn to input an action. I really appreciate this execution, since a lot of JRPGs only halt battles when pressing “enter” or while navigating through menus. Apart from the battles, there are several "mini games" that require to avoid or run away from zombies or to quickly fetch some things to barricade a house so that zombies can't enter. Some of these sequences are difficult, especially when the player isn't accustomed to 2D action games, but they are never unfair and instead manage to make the zombie apocalypse feel more real (also, there's only a few of them). This isn’t "The Walking Dead", where zombies don't pose much of a threat nowadays. Additionally, there are some sequences during which the player has to "perform" while being pressed for time (e.g. flee from a collapsing cave within five minutes like in "Wild Arms 1"). I don't like being pressed for time in JRPGs, but these sequences fit the game's style, and they are - once again - never unfair. In terms of graphics and music/sound, the game seems to rely on resources from RPG Maker 2003's RTP, mixed with a few fitting original pieces. These graphical resources are, to my mind, the best ones to create a Super Nintendo JRPG flair, but as a consequence, this game looks like any other game made with RPG Maker 2003. There's room for improvement when it comes to mapping, but the overall dungeon design is mostly motivating. The developer responds quickly to bug notifications, so the game shouldn't suffer from game-breaking bugs anymore. I enjoyed this game despite the aforementioned flaws, and I encourage any JRPG aficionado to at least give it a try. Galer isn't a masterpiece, but it's a tremendous (mostly) one-man effort, a love letter to classic JRPGs, adding a special zombie touch. Trying like Galer to tweak the formula without breaking it, that's what more classic JRPGs nowadays should try to accomplish.